HEAD’s junior racquet series helps kids to get started on their exciting tennis journey. 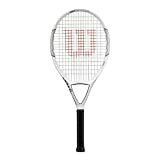 The Radical 23 tennis racquet’s weight and characteristics are perfect for most kids between 6 and 8 years old. HEAD’s junior racquet series helps kids to get started on their exciting tennis journey. The Radical 23 is perfect for most kids between 6 and 8 years old. With matching graphics to the racquet used by tennis pro Andy Murray, this lightweight racquet will win you points in style! String Pattern: 16 Mains x 19 Crosses. Racquet is strung and ready to use.